Home > Marketing > How do I delete a step from an autoresponder series? Q.How do I delete a step from an autoresponder series? To delete a step from an autoresponder, navigate to Marketing → Autoresponder series. Click the (Edit) button for the autoresponder you wish to edit. Next, select the steps you wish to delete, and click the (Delete) button. After deleting steps, the deleted steps will be treated as if they had never existed. 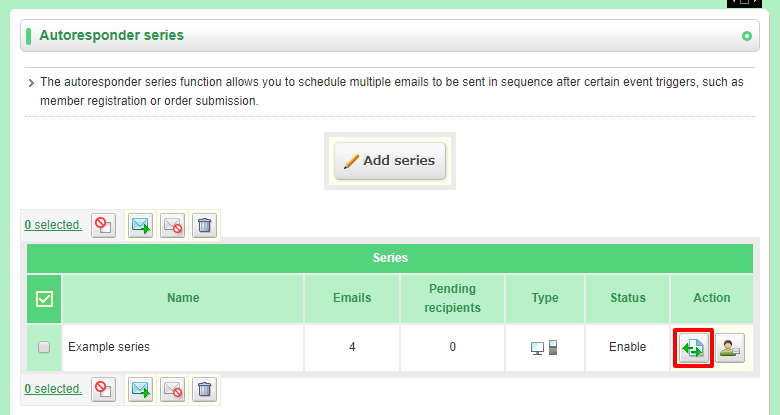 For example, if you delete step 3 in a 4-step autoresponder series, then the former step 4 will now be treated as step 3.